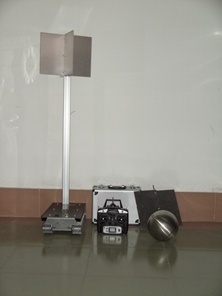 For indoor and outside experiments the chain-driven remote controlled moveable device is able to move freely in the laboratory without any of the limitations of a target table or a rail system. It is part of SkyRadar’s Radar Training System. The sub-system is able to carry various radar targets easily connectable to the target system without the requirement of any tools. Different targets representing various radar cross‐sections (RCS) are supplied with the Radar Training System, including a corner reflector (retro‐reflector) consisting of three mutually perpendicular, intersecting flat surfaces. The multi-channel remote control set includes a radio remote control system that controls the mobile device. Its proportional control channels allow driving, steering and control functions to be remotely controlled independently from one another. The ergonomic housing fits comfortably into your hand and allows for an easy and safe operation of the model and the transmitter. A servo-drive system operating with highly versatile chain-drives. Built-in BEC system supplying the connected receiver incl. servo with the necessary voltage. A control LED on the front of the drive control system informing on the corresponding control state of the drive control system during operation and adjustment. 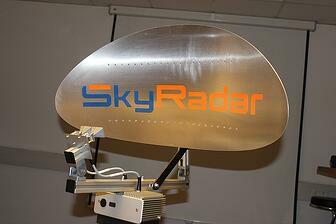 Contact us and ask for SkyRadar’s modular radar training system. SkyRadar develops and distributes radar training systems (CW, FMCW, Pulse, Doppler, Synthetic Aperture Radar, FMCW, MTI, MTD, Primary Radars, SSR, etc.) for universities and academies.